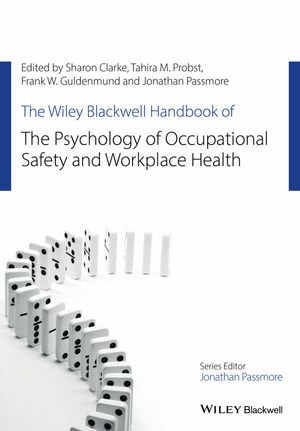 A Wiley Blackwell Handbook of Organizational Psychology focusing on occupational safety and workplace health. Sharon Clarke is Professor of Organizational Psychology and Head of the Organizational Psychology group at Manchester Business School, UK. Her research interests are in occupational safety, health and wellbeing, particularly safety leadership, climate and culture. She is currently Associate Editor of the Journal of Occupational and Organizational Psychology and the Journal of Occupational Health Psychology. She is also on the Editorial Board of the International Journal of Stress Management. Tahira M. Probst is a Professor of Psychology at Washington State University Vancouver, USA. Her research focuses on occupational health and safety, with a particular interest in the psychosocial antecedents of accident underreporting. She is currently co-Editor of Stress & Health and an Editorial Board member of the Journal of Occupational Health Psychology, Military Psychology and the Journal of Business and Psychology. Frank Guldenmund is a Lecturer in the Safety Science and Security Group at Delft University of Technology, the Netherlands. He works primarily in the field of occupational safety, where his research involves modelling and assessing the quality of safety management systems. Within this context he developed an interest in the topic of safety culture, into which he has conducted research for two decades. Jonathan Passmore is an internationally respected psychologist. He has published widely with some twenty books and over fifty peer review papers. He regularly speaks at conferences across the world and has presented over 100 conference papers in Europe, North America, Asia and Africa. He is a full professor at the University of Evora, Portugal, and Managing Director of Embrion, a psychology consulting company.